I was pleased to find out about a NaijaPulse yesterday, through Loy Okezie at Startup Africa. It’s a new microblogging platform, like Twitter, except made to operate in Nigeria (Twitter used to be global, but shut that down to just the US, Canada and India last summer). Everyone is tied to a 140-character update limit, and as Twitter is showing, that is plenty. I really like what NaijaPulse has done with connecting the service to Facebook and Twitter. That way users of the service don’t need to duplicate their entries in both systems. They’ve also created a group feature and support the OpenMicroBlogging protocol that let’s their service share with others easily. NaijaPulse represents a significant step forward on the African continent: utilizing the web + mobile phone to provide communication services that can ultimately be built on top of. I know of one other project going on to do the same thing in another African country. My hope is that we see this implementation of federated systems continue to proliferate around the continent. Where we can find localized versions for every country, but that also allow you to connect to a broader network if you so choose. This idea of a local microblogging platforms for each country/region is where I differ on opinion from Loy. I don’t think that NaijaPulse should try to go for an Africa-wide platform. Instead, they should focus on Nigeria and getting ordinary, non-tech people using their platform. Then, as other sites like this come online around the continent, they should link up and make sure their services are compatible (which should be the case, since they’ll all likely use Laconica). Currently, NaijaPulse does not truly support SMS functionality. Instead they use your carrier’s email gateway to send and receive messages. This is a problem, as it hamstrings the future growth of a “general user” consumer base that have only basic SMS-enabled phones, and no data plans, in Nigeria. The reason why is simple, it costs to send SMS messages (not receive). If you have a person that sends out an update, and they have 100 people receiving that update via SMS then it gets expensive. Who carries that cost? There area two possible outcomes. First, that NaijaPulse figures out a business model that allows for them to cover the cost for their service (most likely it would include subscription model and/or advertising). Second, if they can draw enough of a following, they might be able to go the way of Mxit in South Africa. Their Java-based app sits on the phone, and so a lot of people have found a way to upgrade their phones and get a data plan. I think we’ll start to see new microblogging services showing up in the “hot spots” of African digerati around the continent. Nigeria was an obvious first choice, followed by the South Africans, Ghana and someone in East Africa (Uganda). Whoever does figure out a model that works in Africa could be sitting on a gold mine of users. If there was ever a simple communication service that can work well in almost every part of Africa, this could be it. I’ve been using Twitter for a while now, and have thought quite a bit about it in Africa. More, I’ve thought about what the ramifications of Twitter pulling out of the global market means, and then thought quite a bit about Jaiku, Laconica and Mxit and various other chat/microblogging applications. There is, without a doubt, a move towards short-form updating via mobile and web, and it needs to be federated. There’s something missing in this new mobile + web microblogging movement, and I think it’s location. Most of us use these services for updating, and being updated, by our friends and interesting people. That’s the main use, and it will remain so. The truth is, you and I don’t really care to hear what any random stranger is doing, even if they are nearby. However, we do care what is happening on a very hyper-local level in the case of emergency or “big event”. It’s somewhat like the “pothole theory” that I talked about earlier: you wouldn’t normally care about the pothole on a steet, unless it’s yours. It helps explain why we care about certain things. If you use Twitter and have an iPhone, you’ll probably be aware of Twinkle – it’s an application that enriches your Twitter experience. In Twinkle, you can set your location and then a certain radius from which to receive twitter updates, even if they’re from perfect strangers. I think that’s the beginning of what we’re talking about. However, again… I don’t want to just get updates from random strangers in my locale. I want to only receive the ones that are “important” to me. I want to be notified when there is an emergency, major traffic jam or something else pertinent to me. 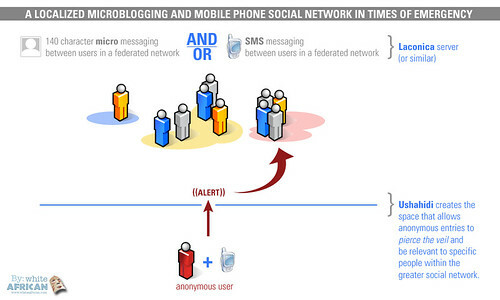 What if we created a way that a greater federated system of microblogging applications could also use location as an alert point? Of course, my current world is colored by Ushahidi, crisis and emergency news coverage. I think of the ability to anonymously send in reports to a system like Ushahidi running in any country, and those who are part of this greater, extended and federated network would be updated – even if that person was unknown and anonymous. John is a Twitter user in Accra, Ghana. Anne has setup a local Laconica server with 5000 users in the greater Accra area. Eddie is not part of any of these networks, just an average guy with a mobile phone. Ushahidi is running in Ghana. 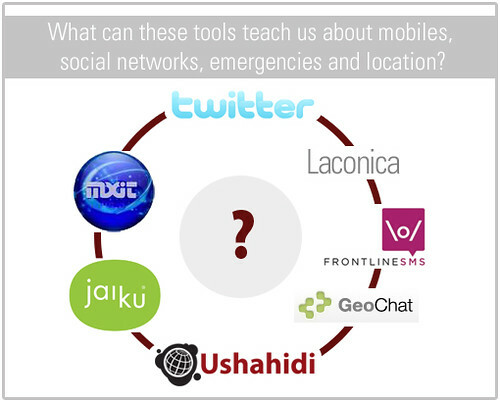 Users from the Laconica group can setup an “alert” for a specific radius from their location using Ushahidi, linked to their Laconica account. An earthquake happens and Twitter and the Laconica server are ablaze with dialogue about what is happening. Eddie (our normal guy), sends an alert into the Ushahidi number, along with hundreds of other Ghanians who are not part of Laconica or Twitter. Anne, and the other Laconica users are receiving alerts (web and mobile) from within their set alert radius automatically, from completely anonymous people. Alerts on where people are trapped, who is missing, who is found, where not to go, and where help is needed most. John, our Twitter user is updating Twitter, but it has no little local implications due to not being able to be used in Ghana (except via web). Local mobile users aren’t receiving his updates, and he isn’t receiving theirs. I recognize that there are a lot of things going on in this scenario, and it’s imperfect, but it serves as a good setting to discuss some of the shortcomings of the current situation and the possible growth areas for them. It also talks to even bigger ideas and the greater impact in Africa of a real social mobile network that can connect people using only mobile phones and do it as needed. There are some interesting things to learn and apply from location-specific alternatives to global SMS gateways (like FrontlineSMS), and I wonder where tools such as InSTEDD’s SMS GeoChat can be used here too. More to come on “getting updates that matter” later, this is just some initial thinking on it. I’d love to hear your thoughts too.